What Does A Hit-Man Say at His High School Reunion? 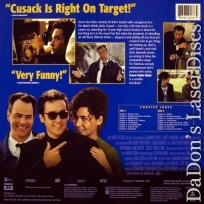 Grosse Pointe Blank 1997 - 107 min. - Color Genre: Comedy Rated R Country: USA LaserDisc Movie Review: Most people have trouble deciding what to say when they're asked what they've been doing with their lives at a High School reunion, but Martin Blank (as played by John Cusack) has a different problem than most --- he has to make his career sound less interesting than it actually is. Martin is a former CIA operative who is now a freelance hit man, making good money for killing people he doesn't know. However, Martin's game has been a bit off lately; he's no longer happy in his work, and both his secretary Marcella (Joan Cusack) and his psychiatrist, Dr. Oatman (Alan Arkin), who is more than a bit nervous about having a hired assassin as a patient, think that Martin should accept an offered assignment in Grosse Pointe, Michigan, his old home town, which would conveniently coincide with his ten year high school reunion. While in Grosse Pointe, Martin discovers that his high school sweetheart, Debi Newberry (Minnie Driver), is still living in town, and still holds a grudge against him for standing her up on prom night. While Martin tries to sort out his past and tie up loose ends with Debi (whom he still loves), he discovers someone in Grosse Pointe is out to kill him; he's also confronted by the highly unstable Mr. Grocer (Dan Aykroyd), a fellow hit man who wants Martin to join forces with him and form a union and isn't keen on taking no for an answer. 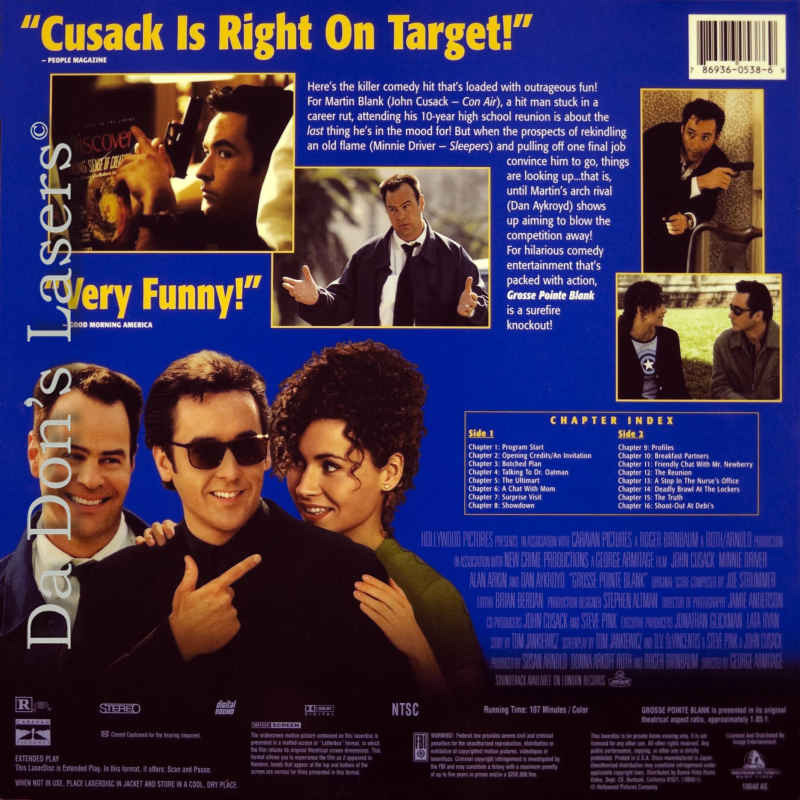 Grosse Pointe Blank was a pet project for star John Cusack, who co-wrote the screenplay and also served as co-producer. --- Mark Deming This is an offbeat, very likeable film about a hitman (John Cusack) who takes an assignment in his hometown, where he is also due to attend a reunion dance. While he's there, he gets an opportunity to take stock of himself, make amends with the woman (Minnie Driver) he stood up on prom night, and figure out just which way his life is going to go. Considering that its subject is a professional assassin, Grosse Pointe Blank is for the most part a surprisingly warm and gentle film, with some fun supporting turns from Joan Cusack and Alan Arkin. It only goes astray near the end, when it lapses into a formula shoot-out, but is still worthwhile and highly entertaining. --- Robert Firsching Thanks for Visiting DaDon's Rare LaserDiscs ! Reviews, Articles, Newsletter and Information for Movies on LaserDisc LD Laser Disc, LazerDisc.